I completed another dishcloth (matches the one I did before) only added a loop so it could hang from the cabinet...I know! Such exciting knitting to report! Heh. Them: "That is pretty, what is it?" Me: "A Dishcloth. Or a handtowel. It matches my kitchen." Them: "But it is too pretty to wipe dishes or hands on!" Them: "And you could buy those so cheap at Walmart!" Them: "Like $3 for a three-pack!" Them: "It seems like so much labor for something you are just gonna mess up!" Them: "If it were in my kitchen, I would get it all stained in two seconds!" Them: "Shouldn't you use your skills to make baby booties or something? How old are you now?" Them: "What happens when it gets all stained? Will it wash out? Is that cotton?" Me: "I made my mom some dishcloths. They tighten up in the dryer and get all soft and thick, and she really likes them..."
Them: "But...But...What do you do when they get all messed up?" Me: "Well, I guess that is their job, isn't it?" Does anyone have a more clever response? I need some ammo, here! It's so fun to see everyone's projects! Thanks for the sharing and the advice! This, of course, is the kimono with SnC. I made the hat from this free pattern and am making the socks/booties from this one. I am not finished with the socks. After researching all of the heartbreakingly cute kimonos on this blog I finally decided on how to finish mine. Come on over to my blog to see what I did. I was getting ready to start the MD burp cloth but I noticed that it doesn't tell me what size needle to use. I will be using the Sugar 'n Cream. It probably doesn't matter much but just wanted to know what others have used. I've been home sick for the last couple of days. It's a bummer, but...I've had plenty of time to work on my new Log Cabin project! I've finished an existing square, started and finished another, and started yet another since Thursday afternoon. I really love the way the Jojoland Rhythm is knitting up. Each square is unique. And the squares are small enough that I can finish one in an evening. Very satisfying. They say there is no such thing as a stupid question...! So, here goes. Does anyone know if Sugar and Cream cotton (sold through Mary Maxim in Canada) is equivalent to Peaches and Cream cotton that I have heard so much about in the MDK book? If so, I want to go out and buy loads this weekend. However, I have had mixed success with another relatively cheap cotton (Bernat Handicrafter - it gave off a lot of fluff while knitting with it). I have finally made my first heartbreakingly cute kimono and guess what? It's heartbreakingly cute! I have a question on the ties. How did you attach them? Was I supposed to sew them in before I sewed up the side seam? Also, I remember seeing some kimonos with ribbon laced through the yarn overs on the front - how were the ends (by the neck) attached? Thanks! I posted last week about how 'ruffly' my MD dishcloth was - thanks for all the response! Glad to know I wasn't the only one. Now I've finished its companion - the MD Burp Cloth, in dish towel mode. I used a large ball of Peaches N' Creme red and had plenty for the cloth and a good size towel. Neither are perfect but they're just for dishes, right? 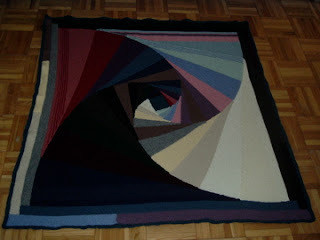 I've posted more pix on my blog at http://nautiknitter.wordpress.com. All Done! I love it! I recently learned that the daughter of a friend is expecting twins in July. I have taken advantage of the opportunity to knit more bibs and try my hand at the burp cloth. The hat pattern is from Last-Minute Knitted Gifts. I used Sugar'n Cream in Light Blue and Rose Pink for the hats and bibs, and Faded Denim and Strawberry for the burp cloths. I think these are so cute! I'm already planning more bibs and burp cloths. I've also finished my version of Kay's Slip Stitch Scarf in Encore Chunky and a dishcloth featuring a crocheted version of a mitred square. Pictures and details are posted on my blog. curve of many colours - done! I would recommend this project to anyone... it is much simpler than it looks. Please see my blog http://knitwitsvengeance.blogspot.com for specs. I'd say "Dayum, I'm good" because I knit this while firmly planted in front of American Idol but I have to admit I did rip twice early on. 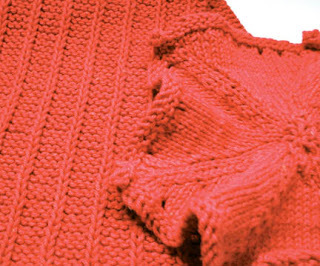 For anyone else who's knit this, were yours ruffly too? I don't mind the look but I do think I must have messed it up. Hit my blog for another picture. Here is the Curve of Pursuit with a border added (log cabin style). Trying to decide whether I should add another teal coloured mitered border (to match the centre square). Pros: use up more of my stash, harmonise the pattern; cons: I have been working on this a bit too long. I just loved Kay's version of the Baby Genius Scarf, so I had to copy it. I used Lambs Pride Worsted 1 skein, in Wild Violet and 2 Skeins Noro Silk Garden in color #224. 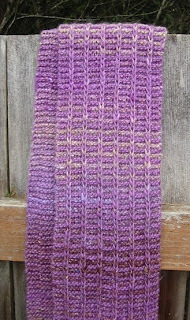 The colors were so pretty and fun to use that I got it done in 2 weeks and I usually find scarves to slow work. It measured 5'3" when I was done. But after hand washing it grew to over 6 feet. It's cozy but the silk garden does make it rather itchy, but the colors make up for itchiness and I have generally overlooked it. I made a red and white ballband warshcloth for a friend for Valentine's Day and when I washed it the red ran into the white! I used Sugar n' Cream yarn. Anyone else had that problem? i've been makin' burp cloths. they're easy and functional. and for a gift. I made a set of boxes for friends at Christmas, using KnitPicks yarn. I had to pass along a picture of how one box is being used... so much for a cat basket! I made a set of boxes for friends for Christmas, using KnitPicks yarn. 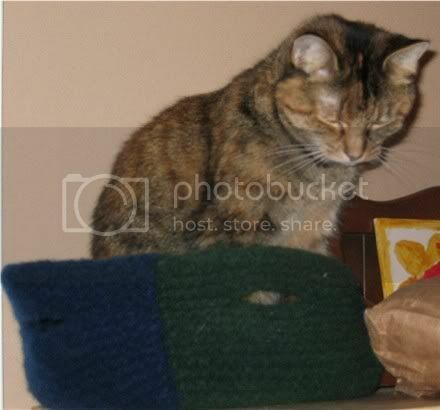 I had to pass along the photo of how it's being used... ...so much for a cat basket! Here is a log cabin dish rag I dashed off. I have been trying to post for a while and had almost given up when the blogger let me switch to the new version and here I am! I am still working on the tail-gate rag rug, but hope to show it soon. Pattern available at www.woollythoughts.com with thanks to Pat and Steve. Can you stand one more baby kimono? These are impossibly cute. And kinda like potato chips. You can't knit just one. 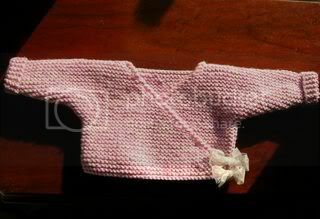 I made this one stockinette with Sugar n' Cream. The hat is from Last Minute Knitted gifts, also made of Sugar n' Cream. These are for my new nephew, to be arriving in a few short weeks. 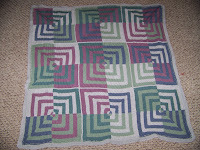 I've finally finished this blanket, I've had it in progress for 2 seasons now. It is going to my sister for one of her babies - she had twins a few months ago. I'm so happy with it though, I want to keep it for myself! The official stats are over at my blog.